Unless otherwise agreed, for groups of 12 persons or more a payment of 10 percent of the total booking price shall be due immediately on confirmation of the booking. Unless otherwise agreed, the remaining amount will be due no later than four weeks prior to arrival without the Hotel issuing a separate payment reminder. In the case of group bookings booked less than eight weeks prior to arrival, the first advance payment of 10 percent shall not apply and the total booking price will be due in full in advance immediately on confirmation of the booking. We know a lot about Bavarian comfort, and so the feel-good factor in our Munich hostel is particularly great. Even the Bavarian specialities are not far. Directly opposite our house you'll find the famous Augustiner Brustuben. Here they brew what must be the best beer in the world. Prost! But a great glass of beer and much more is also available in our own bar, including a chat with people from all over the world. In our cosy guest kitchen, you can also whip up your favourite dish as a change from Leberks and Weiwurst. 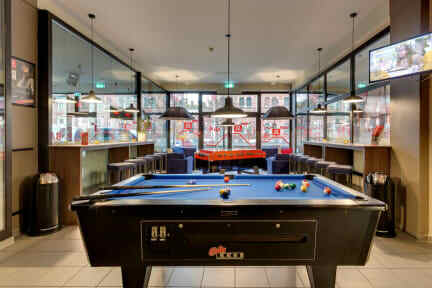 In our game room, a pool table, football table and darts awaits you - either for an international with other guests, or just a friendly match amongst friends. The cosier alternative: just put your feet up in our lobby, relax, or chat away with your friends at home at our internet terminals. What's unique to our hostel is the relaxed international Atmosphere combined with the Bavarian lifestyle. But even the location is great. A 15-minute walk will take you to the Central Station (Hauptbahnhof), and to the city centre almost as fast. We offer accommodation in single and twin rooms, shared rooms or a dormitory. All rooms have their own bathroom with a shower and toilet, and are equipped with a TV set. In the dormitories, showers and toilets are separated. No need to bring bedding - this is included in the accommodation. Please note that you have to be older than 18 years old in order to book a dorm. Earliest check in time is 3pm on arrival date for all Meininger properties. Of course guests can arrive before 3pm and leave their bags in our luggage lockers (for a fee). The hostel was great, we booked it last minute because the hostel we originally booked had bed bugs. We stayed in a room with 12 beds, the room was kind of divided into 2 areas with 6 beds each. There were 2 bathrooms ensuite, which was very convenient. Overall it was a nice experience, rooms and bathroom were clean (except a faint urine smell oozing out of the toilet pot) and it’s not too far from the central train station and city center. It probably isn’t the best place to meet other people. Very large hostel. At arrival we could leave our luggage in the luggage store room but this was paid. However many other guests just left their luggage on the floor and we did as well. We booked in a dorm but got our own private room, which was great. Nice kitchen was available for guests. A little far from the city center but a train station is nearby. Kamers onlogisch ingedeeld; toilet en douches zitten in de andere kamer waardoor je altijd langs andere mensen moeten die toevallig in de andere kamer slapen waar toilet en douche zit. Hostel zit langs een drukke weg. Algemene toilet was vaak niet schoon. Voetbal tafel kapot.